Lock in a great price for InterContinental Wellington – rated 9.1 by recent guests! Breakfast was lovely. Huge variety and beautifully presented. Coffee was excellent. Pool/gym was added bonus. Beautiful place, located near everything so we didn't need a car. The staff really went the extra mile when one of our family members needed to see a dentist for tooth pain. They found us a great dentist and arranged a same-day appointment, on a Saturday no less! The staff surpassed my expectations. Keith, (from Michigan) the doorman, and Shannon, from Ireland, were friendly, professional and extremely helpful with directions and shuttles. The Intercontinental is in a superb position to access everything that is going on Wellington. The hotel has wonderful staff, so warm, friendly, helpful - they actually genuinely care!! I was travelling with an elderly friend and she was so impressed with the Intercontinental - when I booked the hotel I felt certain that she would be! Our room was lovely - very quiet, very nicely appointed, spacious and attractive. The breakfast buffet was quite wonderful with excellent choices for every type of dietary need. Delicious! We ate one night in the restaurant - the duck was superb. We also had a light meal in the bar one night - also excellent. Again, the staff were superb! I stayed once at this hotel when it first opened - it still has the amazing standards one would expect from an Intercontinental hotel! Everything was lovely. The rooms, the common areas, the club and the general location. Good location, next to the water front and shopping area, excellent breakfast. The quality of the hotel, its location and the lovely staff. Beautiful decor, Comfortable, clean and quiet room, stylish bar, every staff member had a smile. InterContinental Wellington This rating is a reflection of how the property compares to the industry standard when it comes to price, facilities and services available. It's based on a self-evaluation by the property. Use this rating to help choose your stay! 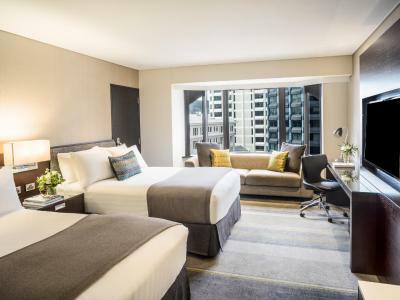 One of our top picks in Wellington.The 5-star InterContinental Wellington is located by the harbor waterfront, just 5 mi from Wellington International Airport. It offers an exclusive club lounge, a fitness center, 2 restaurants and a bar. The elegant guest rooms are spacious and well-furnished. All rooms feature a TV with cable channels and a large bathroom with modern amenities and bathrobes. Some rooms include access to the club lounge. The award winning Chameleon restaurant offers a contemporary menu and is open for breakfast, lunch and dinner. Two Gray bar and Brasserie offers an internationally crafted menu in a luxurious setting. The Lobby Lounge offers a warm and cozy setting to enjoy a snack and cocktail. The Emerge Health Club offers an indoor heated pool, a spa, sauna and massage treatments. InterContinental Wellington provides the perfect base for exploring the region's coast line and wineries. The Te Papa Museum of New Zealand is 5 minutes' walk away. When would you like to stay at InterContinental Wellington? Located on levels 7-9 of the hotel, this InterContinental King Room features a Nespresso coffee machine, luxurious bedding and access to the world-class Club Lounge featuring panoramic harbor views. 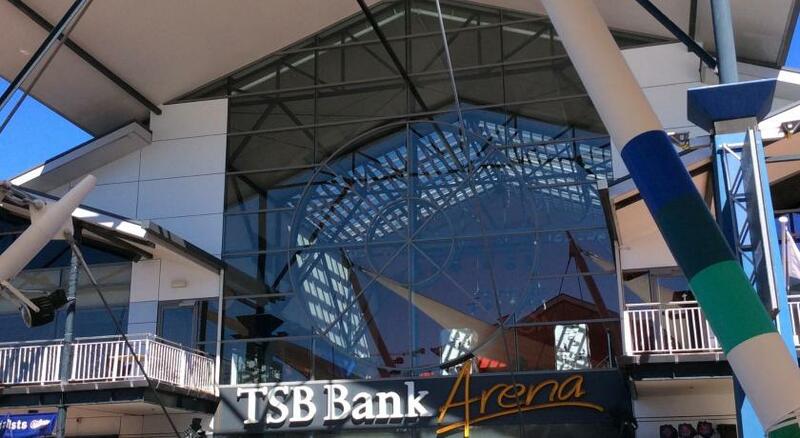 Private parking is available on site (reservation is not needed) and costs NZD 40 per day. Located on levels 2-4 of the hotel, this air-conditioned room features additional windows to allow natural light flow in, a large flat-screen TV and a private bathroom. With two double sized beds, there is no capacity for additional beds. Located on levels 2-4 of the hotel, this air-conditioned room features a large flat-screen TV and a private bathroom. With two double sized beds, there is no capacity for additional beds. Located on levels 2-4 of the hotel, this air-conditioned room features a large flat-screen TV and a private bathroom. With one king-sized bed, please note that the maximum occupancy is 3 (see Hotel Policies). Located on levels 5-7 of the hotel, this air-conditioned room features a 46-inch flat-screen TV and Nespresso coffee machine. The private bathroom has a walk-in shower only, with the main bedroom featuring two double beds. Please note the price is based on 2 guests. Maximum occupancy is 3 (see Hotel Policies). Located on levels 5-7 of the hotel, this air-conditioned room features a 46-inch flat-screen TV and Nespresso coffee machine. The private bathroom has a walk-in shower only, with the main bedroom featuring one king-sized bed. Located on levels 2-4 of the hotel, this air-conditioned room features a flat-screen TV, private bathroom and fluffy bath robes. 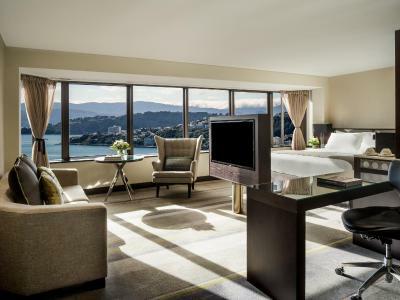 Located on levels 5-7 of the hotel, this sophisticated, refurbished room features stunning views of Wellington Harbor. Complete with air-conditioning, you will also find a 46-inch flat-screen TV, fluffy bathrobes, walk-in shower and Nespresso coffee machine. Located on levels 5-7 of the hotel, this sophisticated, refurbished room features a luxurious spa bath, walk-in shower, fluffy bathrobes, air-conditioning, 46-inch flat-screen TV, and Nespresso coffee machine. Located on levels 5-7 of the hotel, this executive room offers additional space at 42 square yards. In this air-conditioned room, you will also find a flat-screen TV, Nespresso coffee machine, and additional furnishings. Located on levels 8-9 of the hotel, this room features luxurious bedding, Nespresso coffee machine, and views of Wellington’s harbor. You can enjoy access to the world-class Club InterContinental Lounge featuring panoramic harbor views. 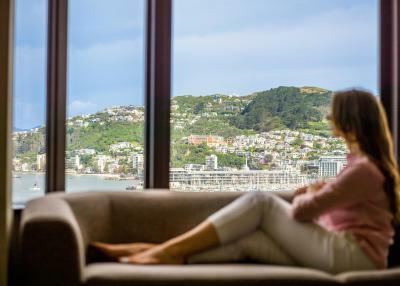 Located on levels 8-9 of the hotel, this suite offers a Nespresso coffee machine, and adjoining lounge area where you can unwind while overlooking the iconic Wellington harbor. The elegantly designed junior suite offers access to personal service in the Club InterContinental Lounge. Please note that your bed configuration is not guaranteed and will be assigned upon check-in. Please note that your bedding configuration is not guaranteed and will be assigned upon check in. 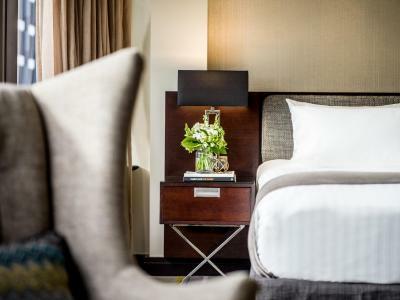 InterContinental Wellington, located adjacent to the New Zealand capital's harbour waterfront, is within close walking distance to popular attractions, and five kilometres from the airport. The hotel is totally non smoking and recently completed a major refurbishment, delivering a new Club InterContinental Lounge, newly defined Deluxe and Club InterContinental guest rooms, a redesigned lobby and dining options. House Rules InterContinental Wellington takes special requests – add in the next step! All older children or adults are charged NZD 75 per person per night for extra beds. InterContinental Wellington accepts these cards and reserves the right to temporarily hold an amount prior to arrival. For rates that include breakfast, please note that it is served in Chameleon restaurant, different policies and additional supplements may apply for extra guests. For buffet breakfast in Chameleon restaurant, the cost is NZD 17.00 between 5 and 12 years old. Please note that there is a 1.5% charge when you pay with Visa and Mastercard and 3% charge when you pay with a American Express, Diners and JCB credit card. The property requires a credit card pre-authorization upon check in to cover any incidental charges. The room seemed tired. The bathroom had a decent amount of someone's long hair. The view was awesome, and the room was well stocked with amenities in the bathroom. The Bath floor was peeling, the ceiling was flaming above the shower head & there was no fan to reduce steam. For the price charged, and the property's perceived status, the overall service offering was shockingly bad. Housekeeping didn't properly refresh consumables. Room service staff got orders wrong (we had to give them a copy of the in-room menu so they could check what was supposed to be included in the breakfast). Restaurant staff were poorly trained. Concierge staff were superb, however the other departments let the team down. Location is excellent, beds were divine. Coffee machine in the room was a bonus. Amazing customer service from arrival to departure. I liked the American/Canadian guy who refunded me x2 fish of the day from Room service when I told him how bad it was. I have stayed at Wellington Interconti many tines for years and that was truly the worst meal ever! Who ever made that meal should be sacked. It was fish of last week, not fish of the day, and as for the ‘gourmet potatos’ they were bad too. I was really turned off. It wasn’t just because of the public holiday. Tonight I am at the Millennium in New Plymouth and I had excellent fish of the day — a top notch gurnard. Room service was poor. Lovely staff though. superb location, friendly helpful staff. excellent advice re nearby restaurants. excellent limo service. Room service made errors on both orders. Ended up paying for food not ordered. Our greeting by staff member at the check in desk could have been more friendly. None of the facilities were explained on arrival (ie location of pool, wi fi password). Only a very small item, but I would have preferred some additional seating in our room. We had a very nice bed, plus a quality work table and work chair (very nice), but no additional furniture to sit on, so with two people and effectively only one chair, I would have preferred a small couch or additional chair. Wasn't a problem, but just a comment for potential improvement. Staff were extremely friendly and the location was perfect. Just a short walk to many local attractions and a short drive to the Inter-Islander Ferry service to Picton. We very much enjoyed our stay.